Chances are pretty good that if you pick a random weekend, somewhere in America there is a collector car auction. These events range anywhere from a piece by piece outdoor sale of an old Midwestern junkyard to the bright lights and ultra high dollar insanity of a Barrett-Jackson event. What you won't be able to find at almost any of these various auctions is what I stumbled upon at last weekend's Ft. Lauderdale Beach Collector Car auction—a collection of 3 ultra rare 1957-1958 Plymouth Convertibles in one place. It's fairly well known that Virgil Exner's design is what made the 1957 Plymouth the third best-selling car in America that year. 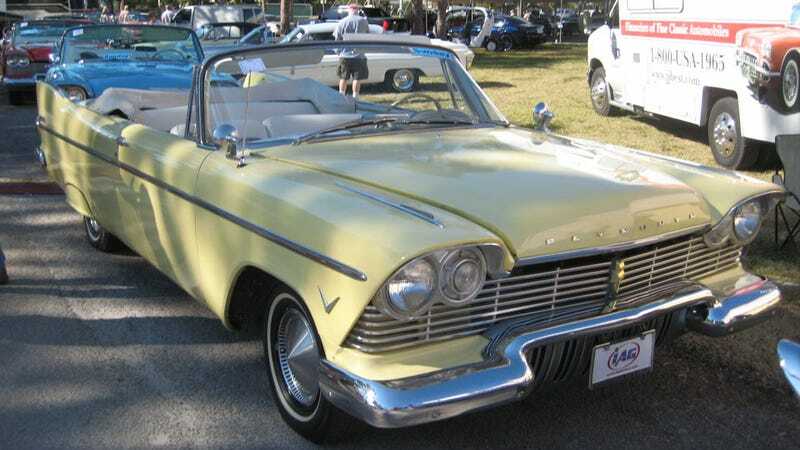 It's also fairly well known that the poor build quality of the 1957 Plymouth and the only slightly redesigned/improved 1958 model is what damaged the company's reputation for decades to come. The result was two years of beautiful cars that had serious design and rust issues almost from the day they left the assembly line. Accordingly the survival rate of 1957 and 1958 Plymouths is unbelievably low compared with many other American cars built in the same time period. This makes any Plymouth from the late 50s a fairly rare sight, especially in convertible form. For this reason, it was almost unbelievable to find out that not one but three of the rare beasts would cross the block at the Florida auction. As a longtime 1957-1958 Plymouth obsessive and someone who attends a decent amount of car auctions, I knew how unusual three convertibles being sold in one place was. 9 or 10 years earlier I had seen a 1958 Plymouth convertible (which may or may not have been the red one pictured here) and a 1957 Plymouth convertible together at an Atlantic City car auction. The 1958 was very nice and had a now absurdly low reserve of $22,000 attached to it—neither cars sold. Since then, when a convertible Plymouth of this vintage crossed the block, it was usually the only one of its kind. When I arrived at the auction last Sunday, the three Plymouths looked stunning sandwiched in a row of beautiful late 1950s American convertibles (click through gallery for pictures). In 1957 and 1958 Plymouth only offered convertibles from the factory in the Belvedere trim package with a V8. None of the cars were anywhere close perfect, in fact the 1957 had some pretty glaring paint and body imperfections, but it was amazing seeing all three in one place. The whole row of convertibles was owned by a large Florida based car dealer who had previously tried to sell the cars including the three Plymouths on Ebay. The yellow 1957 was listed with a buy-it-now of $29,995, the red 1958 had a $49,500 price tag attached to it while the blue 1958 was priced at $59,500. Despite being relisted several times none of the cars had sold. I'd like to tell you that once they hit the auction stage the sight of these three rare cars in one place ignited a bidding war of epic proportions, but they didn't. Despite the auctioneers recognition of how rare the collection of Belvederes was (he said he had never seen three in one place in his entire auction career) none of the cars actually sold. Bidding on the 1957 was closed at $21,000 and the auctioneer claimed $25,000 would have taken the car home. The red 1958 brought a high bid of $40,000 while the blue Belvedere was closed at $47,500. I thought all of the high bids were reasonable prices for the cars even if they were outside of my own personal price range. I knew none of the Plymouths would be coming home with me when I found out the cars would be at the event. Even so, the idea of the blue '58 sharing garage space my beloved '57 four door is still not far from my thoughts. I may have to wait for my shot at 1957/1958 Plymouth convertible ownership, but it was truly amazing to see all three examples of the cars I love in ultra rare convertible form assembled in one place.